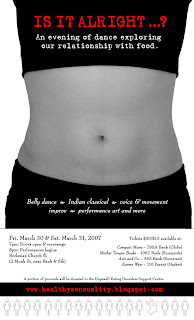 A celebration of dance that supports healthy body image. Find out more about introductory belly dance workshops, and an upcoming performance exploring our relationship with food. Thank you to so many wonderful and supportive people - artists and audience members - who came together to make a hugely successful evening, full of nourishing conversations, stimulating visual art, and touching moments of bodily movement. If you attended the event on March 30/31, we would love to hear from you. Artists put things out into the world (as do we all in our own ways), but get to hear about only a fraction of their impacts. We'd love to receive your feedback... what lingers with you, constructive criticism, or whatever ... feel very welcome to email me or post a comment. I'll be back at this blog when the next project starts stewing! Tickets are now available for an evening of dance and movement that explores our sometimes chaotic yet always intimate relationship with food. Eating is one of the most intimate things we do. It can be joyful, comples, excessive or obligatory. It can be nourishment we accept or reject. In Is it Alright...?, seven artists - with styles ranging from Middle Eastern dance ("belly dance") to classical Indian dance to performance art - will explore the spirit behind this complex relationship. The dancers will create a world community remaining on stage throughout the performance, and will use food discerningly in their movements and interactions with each other. A portion of proceeds will be donated to the Hopewell Eating Disorder Support Centre in Ottawa. A vernissage of visual art related to this theme will be held before and after the performance, including works from Colette Coughlin, Anne-Sophie Dumetz, Mahshid Farhoudi-Di Marco, Ela Kinowska, Pablo Quiroz, and Suzanne Valois. Produced and Directed by Ann Cavlovic. Tickets $20 or $15 for students/seniors/unwaged. 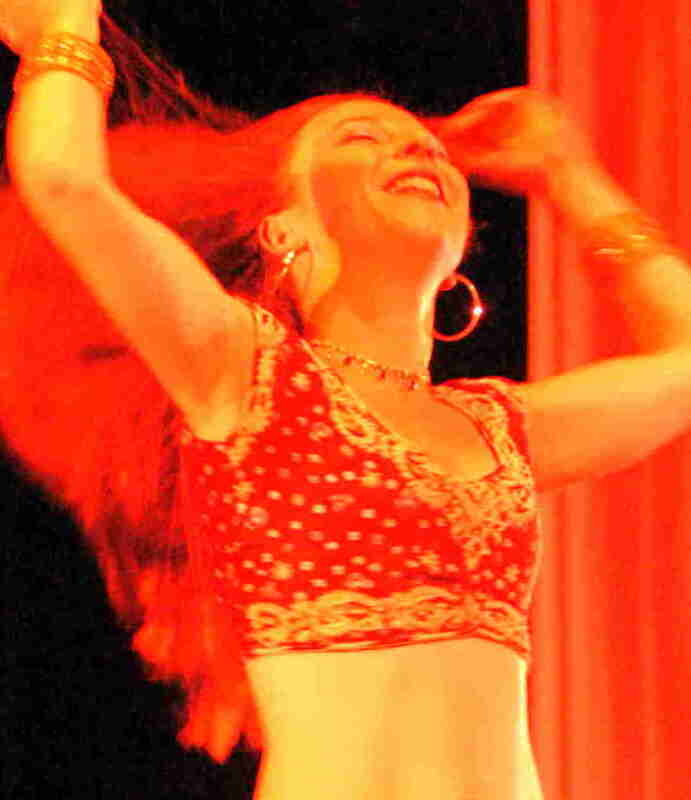 Since 2003, I have led “Healthy Sensuality through Belly Dance” workshops for various recreational and community groups. Workshops are a fun way to get introduced to some basic Middle Eastern dance movements, nurture healthy body image, and to celebrate the sensual in a playful and relaxed setting. Workshops have been held for a variety of groups, including: private groups of women; Girl Guides; crisis line volunteers; hospital workers; and, high school students. In particular, regular workshop are held at the Eating Disorders Clinic at the Ottawa General Hospital. * replace the "atthingy" with an "@", and help me avoid spam!! "everyone i spoke with about the workshop afterwards said they had a really positive experience. personally, i loved the dressing up, and combination of structure (specific movements, etc) with spontaneous creative movement. rock on!" The term ‘belly dance’ is a misnomer, and a historical artefact. Still, I refer to it, since that’s what’s in common usage. Middle Eastern dance or Oriental dance are more accurate. There are many websites out there that already provide a wealth of info on this. If a somewhat distasteful image comes to mind when you hear ‘belly dance’, you are not alone, but you are missing out. This beautiful art form suffers from a bad reputation. But it is not deserved. Please make sure you allow yourself the opportunity to watch a performer who is skilled, embodies a respect for the artform, herself and the audience, and is aware of the cultural roots of the dance. Under those conditions, you are in for a treat. And why such a bad reputation? Well, partly it’s because of Hollywood (if what you think you’ve seen of this dance is from TV, there’s your first problem). But moreover, frankly, some folks propagate this bad reputation in the way they perform. It’s not surprising. The dance is sensual and feminine to be sure, and anything that’s sensual and feminine is likely to be misunderstood in our culture. That applies to performers and audience alike. We are all bumbling through what it means to be human, our bodies and our sensual/sexual expression of them is subject to particular chaos and confusion. We have far more images of the extremes of prudishness or in-your-face sexuality bordering on vulgarity. We need more examples of women who find a balance with grace. I believe this need for a healthy expression of sexuality/sensuality is evidenced by the number of women who flock to ‘belly dance’ classes across North America. It is simply something in our culture that we lack, and we crave it. Anitza (Ann) is an independent dancer who thoroughly enjoys fusing her training in Indian Classical and Middle Eastern dance (Odissi and Raks Sharki, respectively). Since 2003, she has led regular ‘belly dance’ workshops in support of healthy body image for various recreational and community groups. She performed her latest solo choreography at the 2005 Dans/ce Kapital Festival in Ottawa.